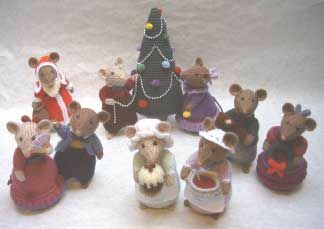 Measurements The mice are 15cm/6in tall and the Christmas tree is 27cm/101/2in tall. You will need Each mouse takes approx. 30g of yarn and 20g of stuffing in total. The Christmas tree takes 30g of Bottle yarn and 35g of stuffing. Of Sirdar Bonus D.K. 100g balls: 1 each in Bottle 973, Mink 946, Oatmeal 946 and Walnut 927, and oddments in Lilac 959, White 961, Silver Cloud 968, Black 965, Chocolate 947, Signal Red 977, Shiraz 945, Dark Chocolate 917, Plum 918, Cerise 984; Navy 971, Denim 994, Violet 985, Aran 993, Mint 956 and Blueberry 952; of Sirdar Country Style D.K. 100g balls: oddments in Greystone 408 and Mustard 537; of Sirdar Snuggly D.K. 50g balls: oddment in Khaki 378; oddment of coral pink tapestry yarn; pair of 3mm (no.11) knitting needles; stitch holder; washable toy stuffing; scrap of stiff card; 1m of silver bead trimming; 10mm and 15mm pom poms in assorted colours; dark green sewing thread; pair of compasses; long tweezers; clear adhesive, hair spray.